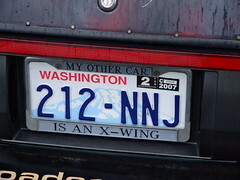 "My Other Car Is An X-Wing"
I can just guess his other battle cry: "Beware, evildoers! You face the wrath of...CAT PISS MAN!" Heh... But on following links I think it's "Her"..